Since I have been developing a lot more lately, I haven't been on my iPad as much. So when I pulled up Day One today, I was kinda sad to see that my last entry was over a month ago. I know Day One has a macOS app but my preferred development enviornment is Ubuntu running on a Lenovo Thinkpad. 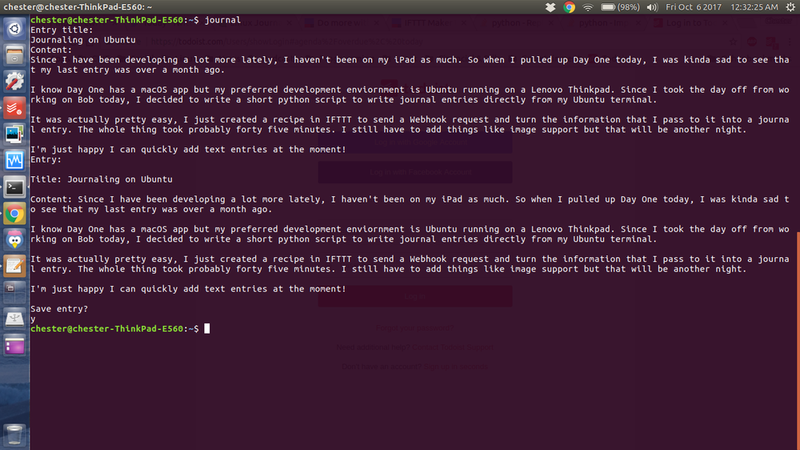 Since I took the day off from working on Bob today, I decided to write a short python script to write journal entries directly from my Ubuntu terminal. It was actually pretty easy, I just created a recipe in IFTTT to send a Webhook request and turn the information that I pass to it into a journal entry. The whole thing took probably forty five minutes. I still have to add things like image support but that will be another night. I'm just happy I can quickly add text entries at the moment! print "Entry: \n\nTitle: "+title+"\n\nContent: "+text+"\n\nSave entry? "